Almost everyone knows the story about the ill-fated RMS Titanic, but are you aware that the Titanic is only the third-worst non-military loss of life to be ever recorded? Two more disasters were ranked as worse than the famous ocean liner, and that's not involving the military ones. Here are ten of the most terrifying maritime catastrophes ever documented. 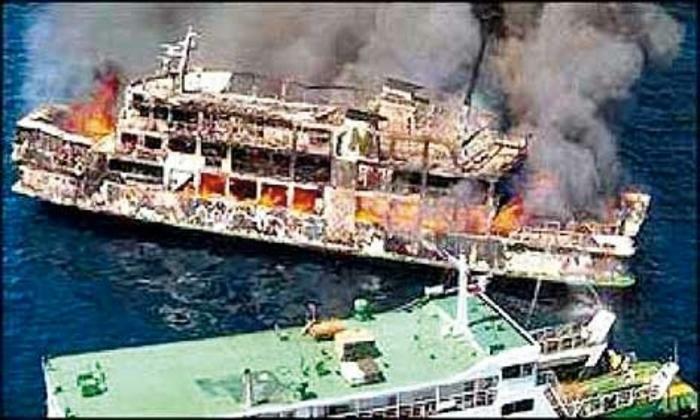 Considered the most fatal ferry disaster in History was the incident of the MV Doña Paz en route to Manila in the Philippines which happened on December 20th 1987. It was officially carrying maximum passenger manifest of exactly 1,583 passengers and 58 crews. The Doña Paz slammed into an oil tanker MT Vector that was loaded with 8,800 barrels of gasoline. Survivors say that although the weather that night was fair, the sea was rough. So upon collision, the Vector caught fire with the flames rapidly spreading throughout the ship. The lights aboard the Doña Paz were extinguished and as there were no available life jackets or they were locked away, the passengers were coerced to jump overboard and into the shark-infested waters. Eight hours passed before authorities were informed of the accident, and further eight hours had elapsed to organize a search and rescue operation. Only 26 survivors were rescued from the waters along with two crew of the Vector. Ferries in the Philippines were lenient back then and would allow as much people to cram especially during peak passenger season. That incident occurred ill-fatedly a few days before Christmas which is among the busiest time of the year. The official manifest of the ship showed 1,583 passengers on board, however anonymous officials’ testified that the vessel was actually carrying around 3000-4000 passengers on board and some were sleeping along the corridors in cots with up to four people squeezed in each. This attestation of the officials is likely to be true due to the fact that only one among the 21 bodies recovered was listed on the manifest. There were 2000 individuals to be reported missing by friends and family believed to have been aboard the vessel, and none of these were on the manifest. Sadly, the official Death toll was 1,749 although a more accurate estimate of deaths was 4,341, a fatality that the World Almanac records as the deadliest maritime disaster during the 20th century.